C Wang, Z Xie, M Li, P Lin, M Cao, Y Xue, C Deng. P Wave Duration And Its Spatial Dispersion In Healthy Subjects. The Internet Journal of Cardiovascular Research. 2001 Volume 1 Number 1. Objectives: To establish the normal value of P wave duration and its dispersion on 12-lead body surface ECG in healthy subjects. Methods: 12-lead surface ECGs were obtained from 2078 healthy Chinese subjects aged between 1 and 87 (mean age 39.4±17.3) years. The maximum (Pmax) and minimum P wave duration (Pmin) was measured by a computerized system. The difference between Pmax and Pmin was defined as P wave dispersion (Pd). Results: There was a progressive increase in the mean values of Pmax, Pmin and Pd with age. The average Pmax, Pmin and Pd in all subjects were 109.9±7.9, 81.0±11.4 and 28.9±10.7ms respectively. 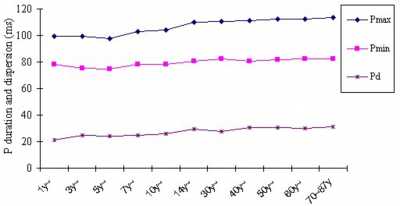 The values of these parameters in those between 1-14 years were 101.5±9.5, 76.9±10.2 and 24.8±7.5ms respectively (p<0.05). Most Pmax was found in lead II (77.0%) or V5 (14.3%), whereas most Pmin was found in lead V1 (74.7%) or V2 (7.8%). Univariate analysis showed a small but significant correlation between Pman and age (r=0.369, p<0.01) or heart rate (r= -0.322, p<0.01), but revealed no significant correlation between Pd and age or heart rate (p > 0.05). Conclusions: The normal value of Pmax and Pd among healthy Chinese subjects is 96-120ms and 8-50ms respectively. P wave duration is influenced by age and heart rate. Recent studies have indicated that P wave dispersion (Pd) on body surface ECG predicts the risk of atrial fibrillation (AF). 1 The normal values of P duration and P dispersion among Chinese subjects are unknown. The present study reports the methodology and results of Pd measurement in 2,078 healthy Chinese subjects. The study was approved by the Human Ethics Committee of our hospital. Between 1996-1998, 2078 healthy subjects aged between 1-87 (mean age 39.4±17.3, 1,185 males) years were selected for the study. Medical history was obtained and physical examination was performed in all the subjects prior to the enrollment. For those who were 60 years old and over, chest X-ray, echocardiography, blood glucose level and lipids were also tested to exclude any potential cardiovascular disease. The subjects were divided into 7 age groups as below: 1-13 years: 274 (145 males); 14-29 years: 409 (203 males); 30-39 years: 412 (207 males); 40-49 years: 404 (206 males); 50-59 years: 295 (193 males); 60-69 years: 20 (182 males); and >70 years: 54 (49 males). 12-lead ECG was acquired in all subjects after 15 min rest with a SR-1000A ECG system ((BOAI Medical Electronic Instrument, Guandong, China). The ECG signals of 30s were acquired and stored on the hardware of the data acquisition system. The ECG waves were then displayed on the computer screen, with the waves enlarged by 2-4 times and paper speed increased to 50-100 mm/s. The P wave duration was measured from the beginning to the end of the P wave as described before.1, 2 The maximum and minimum P wave duration (Pmax and Pmin) was measured respectively from three cardiac cycles and the average of the Pmax and Pmin was used as the value of each subject. The difference between Pmax and Pmin was defined as the dispersion of P waves (Pd). A SPSS/PC software was used for statistical analysis. Data were expressed as means±SD. F test was used to analyze the difference in percentages between groups. Student t test was used for the differences in numerical data between males and females. Univariate and multivariate regression analysis was used for the assessment of relationships between age, gender, heart rate (HR) and P wave duration or dispersion. P<0.05 was considered to be statistically significant. The average of Pmax, Pmin and Pd of the 2,078 subjects was 109.9±7.9, 81.0±11.4 ms and 28.9±10.7 respectively. In most subjects Pmax was found in lead II or V5, accounting for 77.0% and 14.4% respectively. Pmin was mainly found in V1 or V2,with an incidence of 74.7% and 7.8% respectively. If confidence level of 97.5% was used, the normal range of Pmax and Pd 96-120ms and 8-50ms respectively. There was gradual increase in Pmax, Pmin and Pd with age (Fig 1). The average Pmax, Pmin and Pd in subjects less than 14 years were 101.5±9.5, 76.9±10.2 and 24.8±7.5ms respectively, which was less than the average of all subjects (p<0.05). Figure 1. The relationship between age and P wave duration or dispersion. Univariate analysis revealed a small but significant correlation between Pmax and age (r=0.369, p<0.01) or heart rate (r= -0.322, p<0.01). There was no significant correlation between Pmax and gender (p>0.05). Univarate analysis did not show any significant correlation between Pd and age, heart rate or gender (p>0.05). Within the same age group there was no significant difference in Pmax, Pmin and Pd between gender groups (P>0.05) (Fig 1). Stepwise multivariate analysis of correlation between age, gender, heart rate and Pmax, Pmin and Pd gave rise to the relationships in Table 1. Table 1. The relationships between age, gender, heart rate and P wave duration or dispersion. A recent study using intracardiac recording of monophasic action potential in AF patients revealed an increased dispersion in atrial recovery time and action potential duration. 6 This increased inhomogeneity in atrial repolarization may be reflected on the body surface ECG as an increased P wave dispersion. 1. Dilaveris PE, Gialafos EJ, Sideris SK, et al. Simple electrocardiographic marker for the prediction of paroxysmal idiopathic atrial fibrillation. Am Heart J 1998; 135:733-738. 2. Steinberg JS, Zelenkofske S, Wong SC, et al. Value of the P-wave signal-averaged ECG for predicting atrial fibrillation after cardiac surgery. Circulation 1993; 88:2618-2622. 3. Guidera SA, Steinberg JS. The signal-averaged P wave duration: a rapid and noninvasive marker of risk of atrial fibrillation. J Am Coll Cardiol 1993; 21:164-171. 4. Tanigawa M, Fukatani M, Konoe A, et al. Prolonged and fractionated right atrial electrograms during sinus rhythm in patients with paroxysmal atrial fibrillation and sick sinus node syndrome. J Am Coll Cardiol 1991; 17:403-408. 5. Zaputoric L, Marvic Z, Zaninovic JT, et al. Relationship between QT dispersion and the incidence of early ventricular arrhythmias in patients with acute myocardial infarction. Int J Cardiol 1997; 62: 211-216. 6. Li Z, Hertervig E, Yuan SW et al. Dispersion of atrial recovery in patients with atrial fibrillation. Chin J Card Arrhyth 1999; 3:271-275. 7. Wang B, Chen KL, Deng SZ et al. The predicting value of P wave dispersion for paroxysmal atrial fibrillation. J Card Funct 1999; 11:162. 8. Cheema AN, Ahmed MW, Kadish AH, et al. Effects of autonomic stimulation and blockkade on signal-averaged P wave duration. J Am Coll Cardiol 1995; 26:497-502. 9. Wijffels MCEF, Kirchhof CJHJ, Dorland R, et al. Electrical remodeling due to atrial fibrillation in chronically instrumented conscious goats: Roles of neurohumoral changes, ischemia, atrial stretch, and high rate of electrical activation. Circulation 1997; 96:3710-3720. 10. Spach MS, Dolber PC. Relating extracellular potentials and their derivatives to anisotropic propagation at a microscopic level in human cardiac muscle: evidence for electrical uncoupling of side-to-side fiber connections with increasing age. Circ Res 1986; 58:356-371.